all I feel like wearing are cozy sweaters! Gurrrrl, you are going to make me go back to the thrift store to hunt down that red and white striped sweater that I left behind, aren't you? And with my luck, it'll be gone. Hmmmmpfh!! I really love the striped sweaters. I'm especially in love with the blue one with wide stripes and I'd wear it to death. 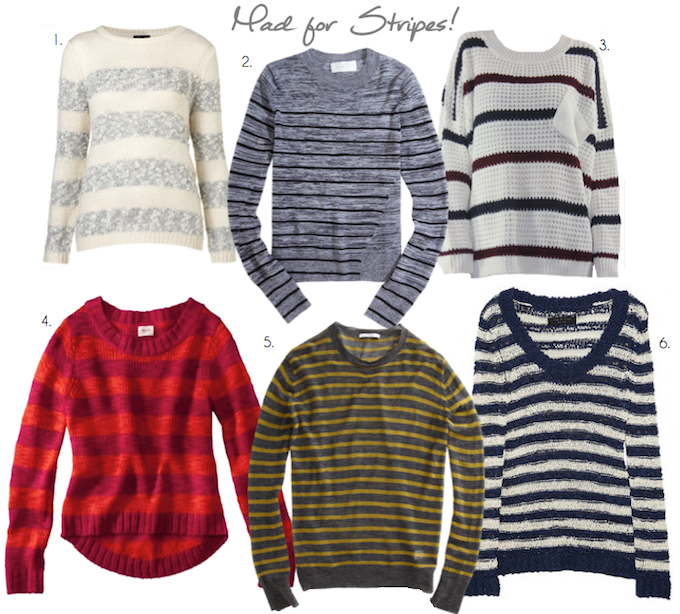 Love striped sweaters, you can style them so many different ways! Love #1! i need all of those! horizontal stripes... i never realized how much i loved them til I noticed I own four black/white versions alone. Love the destroyed look in the first photo! I'll take one of each please. I'm all about striped sweaters too! i need an oversized striped sweater! I too am digging the stripes. Particularly striped sweaters! Love this.